The Great Ocean Road is a 243-kilometre (151 mi) stretch of road along the south-eastern coast of Australia between the Victorian cities of Torquay and Warrnambool. It is an important tourist attraction in the region, which winds through varying terrain alongside the coast, and provides access to several prominent landmarks; including the nationally significant Twelve Apostles limestone stack formations. The Twelve Apostles is a collection of spectacular giant limestone stacks off the shore of the Port Campbell National Park, by the Great Ocean Road in Victoria, Australia. They rise up to 70 metres from the Southern Ocean and it is breathtaking example of nature at work and is the third most visited natural site in Australia. The Twelve Apostles were originally known as the "Sow and Piglets", the mother pig and her little offspring. The early settlers renamed this amazing rock formation after the disciples of Jesus Christ. The rocks formed up to 20 million years ago, and are created by the sea gradually eroding the soft limestone cliffs, forming caves in the cliffs. The caves eventually became arches and when they collapsed rock stacks up to 45 metres high were left isolated from the shore. The coast is slowly changing and there are frequent small rock falls. There are also infrequent major events, the most recent occurred on Sunday 3 July 2005 when a large stack collapsed and now only eight left. To further enhance the popularity of the Twelve Apostles for the tourist a Visitor Centre was built by Parks Victoria. From the Visitor Centre you can access a few viewing platforms for perfect photo opportunities of the Twelve Apostles. Sunrise and sunset offer particularly impressive views as the Twelve Apostles change colour from dark and foreboding in shadow to brilliant sandy yellow under a full sun. There are some wonderful sights in this part of the coast, including The Arch (it collapsed recently), London Arch (previously called London Bridge), The Grotto and the Bay of Islands. The Gibson Steps are an area of cliffs on the south coast of Australia. The cliffs are the first sightseeing stopoff in Port Campbell National Park for travellers heading West along the Great Ocean Road, located about 5 minutes drive away from The Twelve Apostles. The name Gibson Steps refers to the staircase leading down to the stretch of beach shown to the right. The Loch Ard Gorge is part of Port Campbell National Park, Victoria, Australia, about 10 minutes drive west of The Twelve Apostles. It is a visible example of the process of erosion in action. The gorge is named after the clipper ship Loch Ard, which ran aground on nearby Muttonbird Island on 1 June 1878 approaching the end of a three-month journey from England to Melbourne. Of the fifty-one passengers and crew, only two survived: Tom Pearce, a ship's apprentice, and Eva Carmichael, an Irishwoman immigrating with her family, both of whom were 18 years of age. According to memorials at the site, Pearce was washed ashore, and rescued Carmichael from the water after hearing her cries for help. Pearce then proceeded to climb out of the gorge to raise the alarm to local pastoralists who immediately set into plan a rescue attempt. The arch of the nearby Island Archway collapsed in June 2009. The feature now appears as two unconnected rock pillars. They have since been officially named Tom and Eva after the two teenage survivors of the Loch Ard shipwreck. The gorge is accessed via the Great Ocean Road, several kilometres past The Twelve Apostles. Stairs allow visitors access to the beach which is otherwise undeveloped. 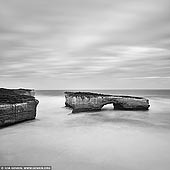 London Arch is a natural arch in the Port Campbell National Park, Australia. The arch is one of the tourist attractions along the Great Ocean Road near Port Campbell in Victoria. This stack was formed by a gradual process of erosion, and until 1990 formed a complete double-span natural bridge. The arch closest to the shoreline collapsed unexpectedly on 15 January 1990, leaving two tourists stranded on the outer part: they were rescued by a helicopter. Fortunately nobody was injured in the event. Prior to the collapse, the arch was known as London Bridge because of its similarity to its namesake. The Grotto is a sinkhole geological formation and tourist attraction, found on the Great Ocean Road outside Port Campbell in Victoria, Australia. Wooden steps wind down the cliff face to the bottom, providing visibility of the sea beyond a pool at low tide. The Twelve Apostles and suppounding area are must-sees and it doesn't really matter if you are traveling in summer or winter, you'll be in for a treat.